The Jakarta Post takes very sceptical view of Soeharto’s ‘live’ announcement yesterday. 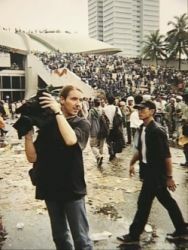 Where were the dissidents – Amien Rais, Megawati, Emil Salim et al* – who’d pushed him so far? The Post reports that all embassies are recommending evacuation, then has article with quotes from those of us with family commitments who can’t leave. But two friends with Indonesian wives are …. where? P, who’d been interviewed by phone by BBC radio & L have possibly headed for Bali. (One time I rang them, L was trapped one street away from their home in Bintaro.) J & I, with 3 pre-school children, will probably head Manodo or the Moluccas on Friday. Both P & J are on an extended break from the Korean International School so both have time ~ and dollars! If my office stays shut for another week, I think we may head for Bali. Why not? Turns out that P & L have gone to Kuala Lumpur. Due to embassy warning? * And why not tell us? I check with embassy – ensure I’m still registered with them and basically confirm that sitting here doing nothing is best. Unsure even about which CD to play or which book to read; nothing will fit a mood which is impossible to define. Those of us still here say the same. The TV channels show lots of ‘we are all God’s children’ music performances. And the Clint Eastwood/Charlie Sheen epic The Rookie. Lots of lovely blood although the gunshots don’t sound like those I heard here in Jakarta. *P told me today that the previous night his electricity had been cut off just as he was answering a phone call from his worried family in Britain. At the same time, the local security guards had come down his street advising everyone to prepare buckets of water in case of fire ~ crazed mobs were expected. All constitutional, but acceptable? Wiranto, army chief, says the army will protect Soeharto and his family. Boo, hiss ~ but what else? 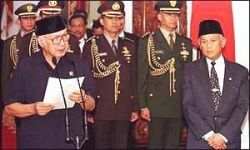 Soeharto leaves the palace – with Tutut his ‘public’ daughter and lately Minister for Social Welfare (hers?) – in a civilian registered stretch Mercedes. Habibie leaves in the presidential version. On another channel, a documentary on the 60’s – Peace, Love and Demonstrations (and great music). Who will be on the Comite Reformasi, now presumably chaired/engineered by Habibie? A consensus arises, documented live-ish on TV, that the succession was not done constitutionally ~ why at the palace and not in front of the supposedly elected legislature? An anchorperson signs off ~ Selamat reformasi (long live reformation). Following The Rock Revolution, which closed with John and Yoko singing Give Peace A Chance, we get another documentary entitled The Art of Illusion, Hollywood’s take (and give?) on reality. The students are still at the parliamentary buildings. News surfaces: the students are digging in, people are supporting them with food, messages and neighbourhood discussions. Whatever new corruption-, cronyism- and nepotism-free cabinet is formed by Habibie will not be legitimate if Habibie’s there. Another sleight-of-mind by the master? If so, we hear at 5.30pm. that it’s not happening – 14 cabinet ministers have tendered their resignations. We haven’t heard the names of Bob Hasan (Soeharto’s golfing buddy) or Tutut. News in English, 6.30 TVRI. General acceptance of the situation; the students have won the first round. Let’s not forget Soeharto’s achievements over 32 years, great statesman is international viewpoint ~ and one must concur. The death of his wife, Madame Tien (per cent), must have destroyed much of his drive. The children became more arrogant and must, eventually, be brought to account, preferably fiscally but judicially if just cause can be found. Or the country can conciliate, openly, and forge a new openness and respect for – and from – the community at large. We all await to see who’s in the new cabinet, but this could be the end of our siege mentality. This country has lanced a boil. I can’t help asking. I notice you mentioned (more than one time) that you did not have dollars and you needed dollars to go abroad (to evacuate). Well, I thought being an expat in Jakarta, you earned dollar bills in whatever you did. All expats I know are like that. Pardon me, I’m just wondering. “All expats are like that”? My, Inet, you do live a sheltered life. If you went to work in another country, would you expect to be paid in rupiah? No, the vast majority of westerners you see here, outside the five star hotels and expat enclaves like Kemang, live and work here. If you’ve been reading Jakartass regularly, you’ll know that I’m supporting an Indonesian family, that I travel by public transport (although as infrequently as possible!!) and I live at street level as part of an Indonesian community. As do most of my expat friends and colleagues.